إذا كنت تبحث عن فندق بموقع جيد في Bay of Islands، فقد وجدت ضالتك في Bay Sands Seafront Studios . يمكن من هنا للضيوف الاستمتاع بسهولة الوصول إلى كل ما تقدمه هذه المدينة النابضة بالحياة. يوفر الفندق بفضل موقعة الجيد وصولاً سهلاً إلى أهم معالم المدينة.
. يقدم Bay Sands Seafront Studios خدمات لا غبار عليها وكل أشكال اللياقة وحسن الضيافة اللازمة لإسعاد ضيوفه. هذه بعض الخدمات الموجودة في هذا الفندق: مكتب الاستقبال على مدار الساعة, مرافق مخصصة لذوي الاحتياجات الخاصة, تخزين الأمتعة, واي فاي في المناطق العامة, صف السيارات. في Bay Sands Seafront Studios غرف نوم يزيد عددها عن 10 صممت بذوق وعناية لتوفر لك كل وسائل الراحة . بعضها يحتوي أضاً على تلفزيون بشاشة مسطحة, اتصال لاسلكي بالإنترنت, غرف لغير المدخنين, تدفئة, مكتب. يمكنك الاستمتاع بالأجواء المريحة التي تقدمها مسار جولف - ضمن 3 كم, تدليك, حديقة, رياضات مائية (غير آلية) طوال النهار. يحظى فندق Bay Sands Seafront Studios بموقع ممتاز وخدمات يصعب منافستها. Property is near to the sea. However not walking distance to nearby eatery. Need to drive. Parking at property is limited. Room can be better and is a little shabby. Could do with new curtains to brighten up the place. We had a great experience! The rooms are a bit out dated, but they were clean and the staff was beyond helpful and accommodating! We arrive mid morning and the man running the office helped set us up on a Bay of island boat tour, sale day, which was an incredible experience! I would recommend this hotel, it's a great value for the price. Only a quick walk to the wharf and town with restaurants, beautiful sights, and shopping. We were very happy with our accommodation, the rooms are basic and a little dated but importantly are clean and comfortable and had a handy kitchen. We had a ground floor unit looking across to the water. The units themselves are only about a pleasant 10 minute stroll to the main area of town which makes them a bit quieter as they are removed from the restaurant/traffic areas. The largest supermarket is only about a 5 minute walk around the corner. Staff very pleasant and friendly. Staff was very helpful. Good value. 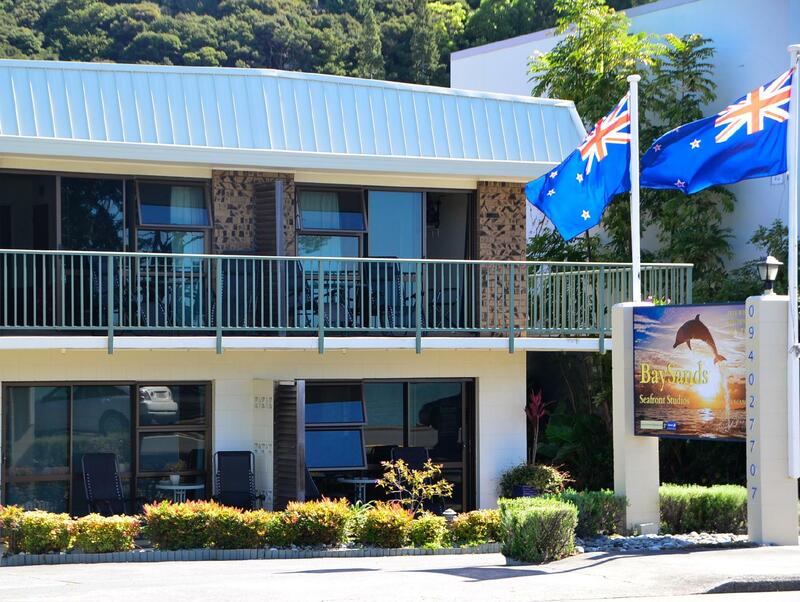 This is a good place to stay if you want the convenience of being near Waitangi, Russell, Kerikeri etc but in the next bay to the jetty. It's on the road facing the beach, so some road noise but this reduced at night. The studio was a little tired and had a small kitchenette, but was walking distance from a takeaway fish & chips, a basic supermarket and several restaurants. The owner provided a map and discounts for nearby attractions. 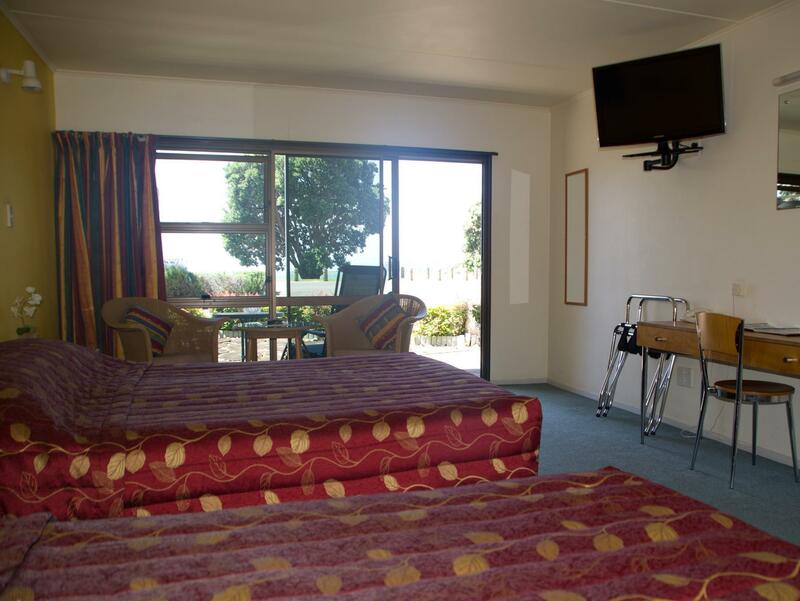 We had a great stay in Paihia, the staff were very friendly and helpful. 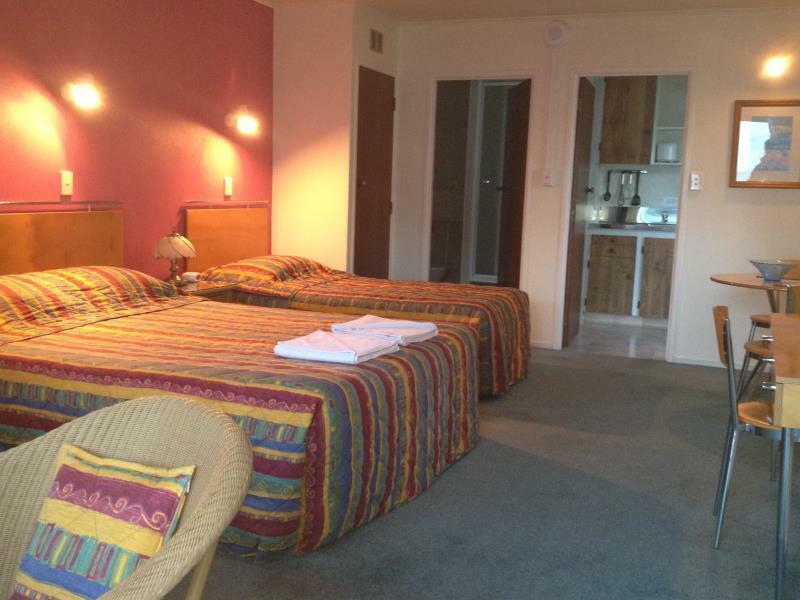 The location was only a few minutes walk to downtown Paihia and the hotel was right across the road from the beach. I would stay again!!!! 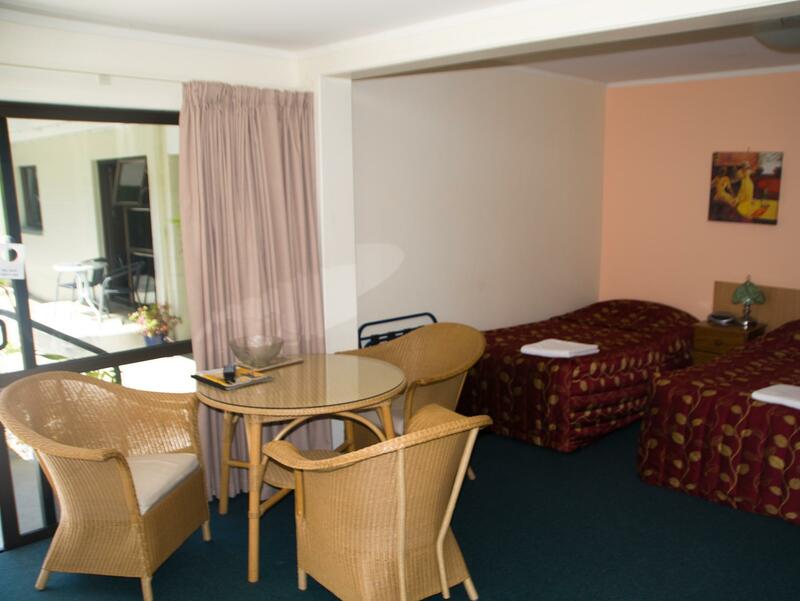 Beach just across the road; spacious room with kitchenette and meals area; armchairs in the room, plus armchairs out on the balcony overlooking the beach. A pleasant and relaxing stay. This hotel is located just around the corner from the main group of shops which are approximately 5 to 10 minutes to walk to. It is right opposite a lovely beach. It is old but in great condition and very comfortable and clean. It is 2 levels, so if you are on the ground floor you can park right outside your room, and there are pot plants in the garden making it look very pretty. The staff were very helpful and nice. We had a one bedroom apartment with a deck and table. We loved sitting there for breakfast. The dishes were done and the room made everyday. The kids got hot in their room overnight so we told the gentleman in reception and he bought us and extra fan. There are no fly screens or air condititioning but nowere in Paihai seems to have them. The wifi was excellent with no complicated login. No comment on the hotel. The hotel is just 10 mins walk from ferry and bus stop. The host helped us to book boat trip, after confirming with the company. The one of previous day was cancelled due to bad weather, luckily we can sail to the hole of the rock! We bought food from countdown and cook at the hotel, the kitchen enabled us to cook easily, and we can enjoy the meal at the balcony, with the nice sea view. Awesome! Clean, spacious and great ocen view. Most enjoyable. Friendly and helpful host. Room maintenance was very good. it is near the sea, about 10 minutes walk to the city centre..
it was nice staying there..me and my family stayed there for 2 days during our holiday..would not say the room is small because we asked for an extra bed, so, it did take away some space.. one thing i have a problem with though is the bathroom..the bathroom is like the same level with the room (which most place in new zealand seems to be like this), which cause the water from the bathroom to sometimes flow out onto the carpet of the room..other than that, i am happy with the place.. Very economic for whole family,we had 4 ppl n stayed in 2 brm. The only unpleasant exp was the alarm went off at 4am at night, for no reason. Other than that all sweet!